This blog tells the story of a German Reservist from 5th company of Königlich Bayerisches 16. Infanterie-Regiment “Großherzog Ferdinand von Toskana” . Michael Maier and the 16th Bavarian Infantry Regiment took part in the counter-attack on Montauban on 2nd July. It seems remarkable to have a record of one of the men attacking the 16th & 17th Manchesters when Arthur Bell was at Triangle Point. It may have been Michael Maier or one of his Pals that bombed out the detachment at Triangle Point; or shot the hole through Arthur’s helmet. 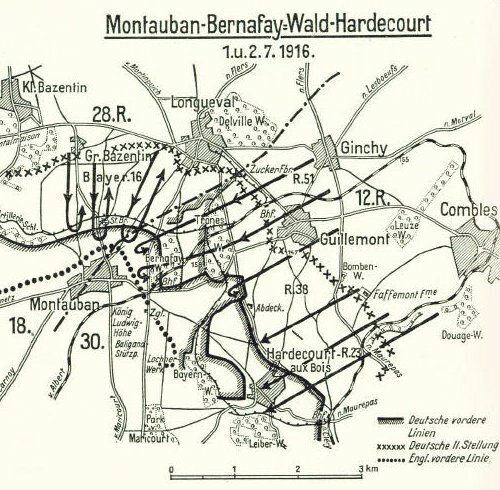 This plan shows the movement in the failed German counter-attack in the early morning of 2nd July, The 16th Bavarian Infantry Regiment of the the 28th Division is shown as assaulting from (Gr.) Bazentin La Grand towards the British Positions immediately north of Montauban. Michael Maier took part in this attack. This plan shows the British defensive positions that faced the Germans. 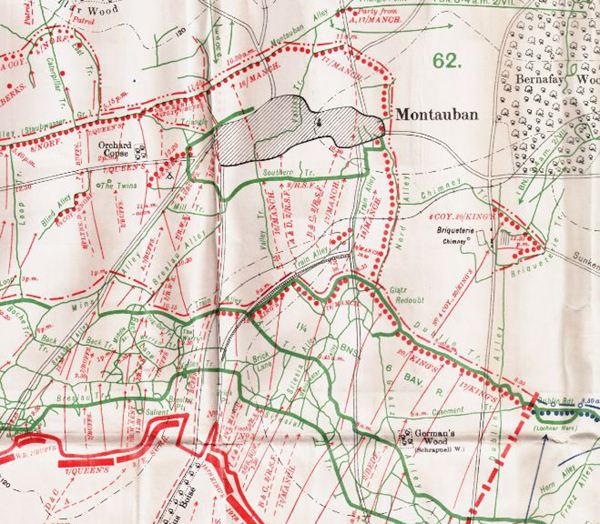 The 16th Manchesters held out and repelled the assault to the north east of Montauban. The 17th Manchesters successfully defended the northern and eastern approaches to the village. Arthur Bell’s detachment ran out of bombs and were forced to withdraw to an isolated shell hole between Triangle Point and the 17th’s main defensive line. Michael Maier’s Regiment temporarily occupied Triangle Point and part of Montauban Alley leading towards the 16th Manchester positions. They were then repelled and withdrew as shown on the German plan. 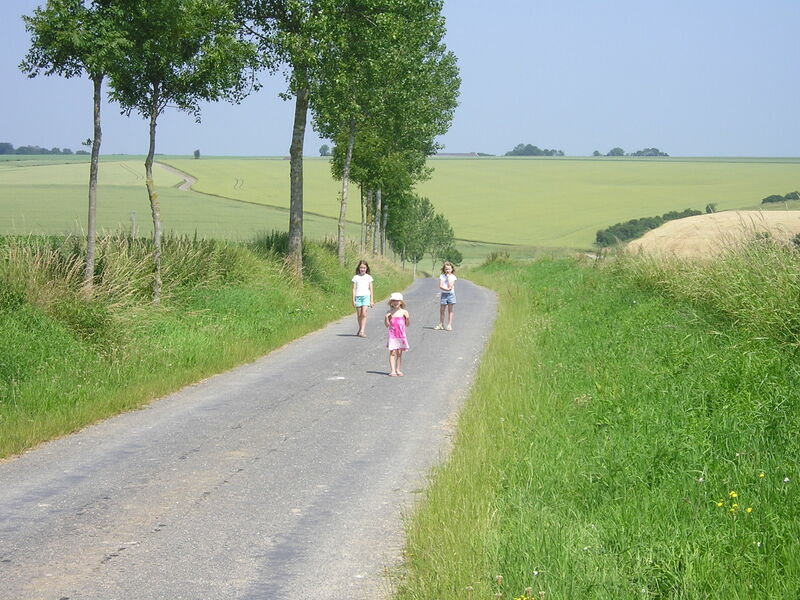 View from the position of Triangle Point facing north down Caterpillar Valley and the road to Bazentin Le Grand. The children are approaching from the same direction as Michael Maier advanced with the 16th Bavarian Infantry 90 years earlier. This entry was posted in First World War, Manchester Regiment, Manchester Regiment,, Montauban, Somme, WW1 and tagged 17th Manchesters, Manchester Regiment, Montauban, Somme, World War I on May 19, 2013 by 8055bell.